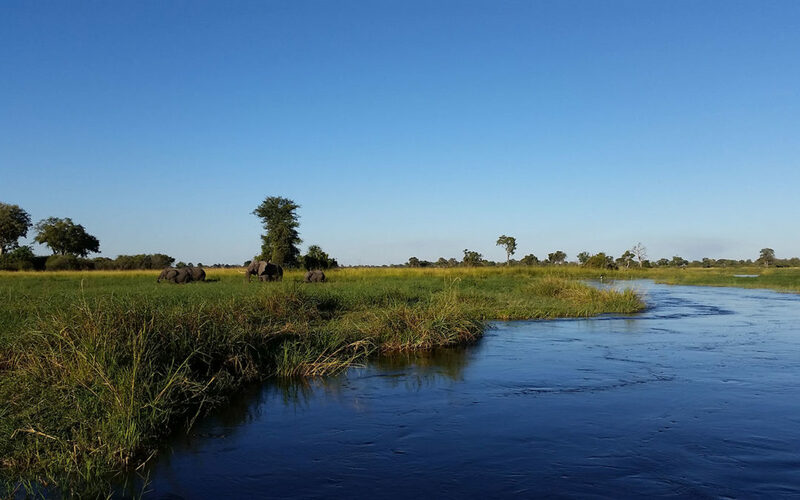 Botswana is generally a place of empty blue skies and boasts an enviable 300 days of dazzling sunshine a year. Thankfully around end of November, life-giving summer rains begin to fall, marking the start of the Green Season. The bulk of rain falls over January and February, and the landscape stays beautifully lush and green until about April. Many safari-goers recommend visiting during the May to October dry winter season when game viewing is at its easiest. With only winter’s sparse vegetation to hide them, animals are more visible, especially when they congregate at shrinking waterholes and on riverbanks as the dry season grinds on. A visit during the rainy seasons will undoubtedly leave you with more than a few surprises. Firstly, the rains transform the brown winter landscape into a startling green wonderland. Full-leafed acacia trees cast deep, cool shade over rolling green lawns; flowers leap up unannounced out of the sand, and crusty salt pans turn into shimmering wetlands full of honking waterbirds and colourful migratory species. Photographers will love the Green Season has the clean-washed air makes colours richer and deeper and the cloud-stacked sunsets are more intense. As dramatic as the afternoon sky, so too is the reaction of Botswana’s wildlife to the rains. Antelope like impala and springbok take advantage of the new greenery to give birth – seemingly all at the same time! This is, of course, excellent news for Botswana’s long-toothed predators. If you want to see nature at its most ruthless and bittersweet, head for the nearest herd of ear-twitching herbivores with their lambs and wait for the circle of life to take its course. And not only do many animals drop their young in the Green Season, they also gather in great herds and go marching across the country. Chobe National Park erupts into ‘lights-camera-action!’ drama as the annual zebra migrations, eagerly followed by big cats and wild dogs, rolls into town for the fresh summer grazing. And then there are the birds. Botswana has a wonderful range of resident species but as the rains arrive, so do migrant birds from Europe, Asia and other parts of Africa. Botswana’s bird watching goes from superb to sensational: kingfishers, kites, swallows, bee-eaters, rollers and cuckoos fill the air with extravagant song and colour. Everywhere is good for birding – from the Okavango Delta to the Chobe River… even non-birders will get caught up in the excitement during a Botswana Green Season safari. So next time you plan your Botswana safari. Go against the crowd. Be the rebel you know you are. You will probably miss the crowd and Botswana will put on a show you will never forget.